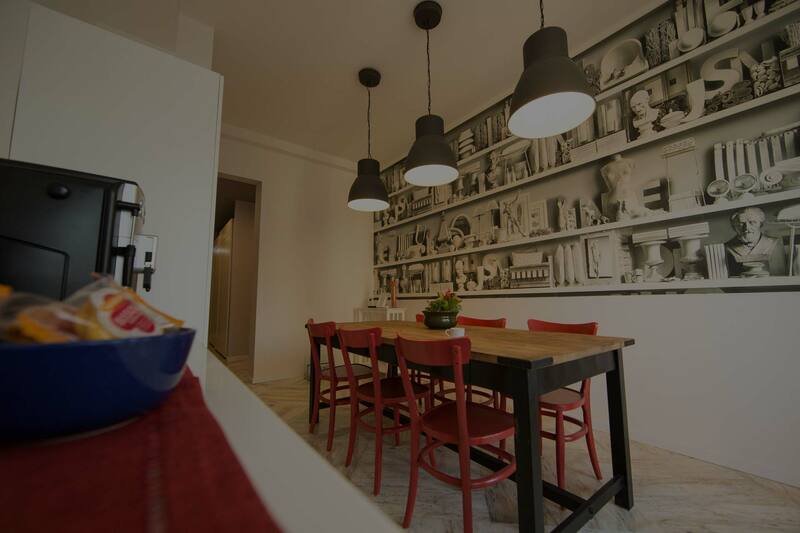 The B&B Roma 474 links past and present, modernity and tradition. The contemporary and metropolitan style of the B&B blends seamlessly with the decorative baroque marbles and majestic atmosphere of Rome’s 900 churches. Our B&B allows you to enjoy the incredible history of this city, unparalleled anywhere in the world, in 21st century comfort. 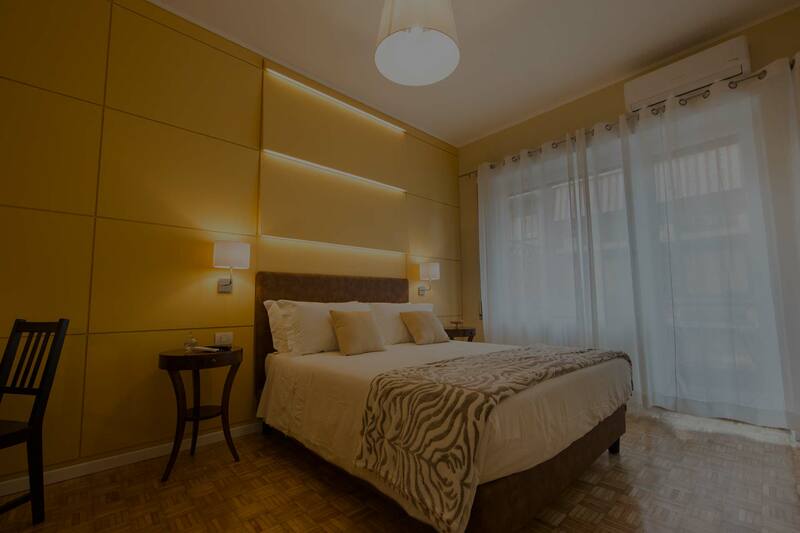 Whether your interest lies in the Ancient Roman Empire, the luxurious nightlife of La Dolce Vita or the modern art scene at the MACRO, B&B Roma 474 adds a touch of elegance and style to your Roman experience. We are at your disposal to ensure your stay with us is as unforgettable as our city. In establishing Roma 474, our goal has been to offer the warmth and personal touch typical of B&Bs coupled with the professionalism, comfort and cleanliness associated with top service of larger hotels. We consider ourselves a micro boutique hotel in many ways, especially when it comes to comfort. After a day of activity around Rome, our guests can relax in an oasis of peace. Every bedroom is soundproofed and each bed is equipped with the prestigious Dorelan Hotel mattresses used in the most luxurious hotels across the city. Guests can sip an afternoon tea on their private terrace. They can watch HD television or use the complimentary WiFi in air-conditioned comfort. Even the en suite bathrooms, with their modern accessories and uplifting colours, have been designed with guest comfort in mind. We strive to ensure our guests have the best possible experience during their Roman stay. We go the extra mile to provide assistance and accommodate their requests when possible. Continental breakfast is included. It is usually offered in a café adjacent to the B&B except for Sundays and holidays, when it is served in the Common Room. Complimentary coffee and tea are available at all times in the Common Room. In addition, we can offer information on transportation across Rome and we can guide you to our preferred travel agency nearby for trips further away. For lovers of good food and wines, we offer advice on restaurants and wine bars. Information on Roman tourist sights is available in the Common Room. We will point out local laundry and dry cleaning services. Roma 474 has been designed by one of the most innovative architectural firms of Rome, the Dolmen Factory. Every inch of space aims to combine the elegance and functionality of top boutique hotels with the comfort and atmosphere of B&Bs. Every bedroom has an en-suite bathroom and private terrace with table and chairs for a morning coffee or an evening aperitif. Every room is soundproofed to provide guests with a cocoon of peace at the end of a hectic day. 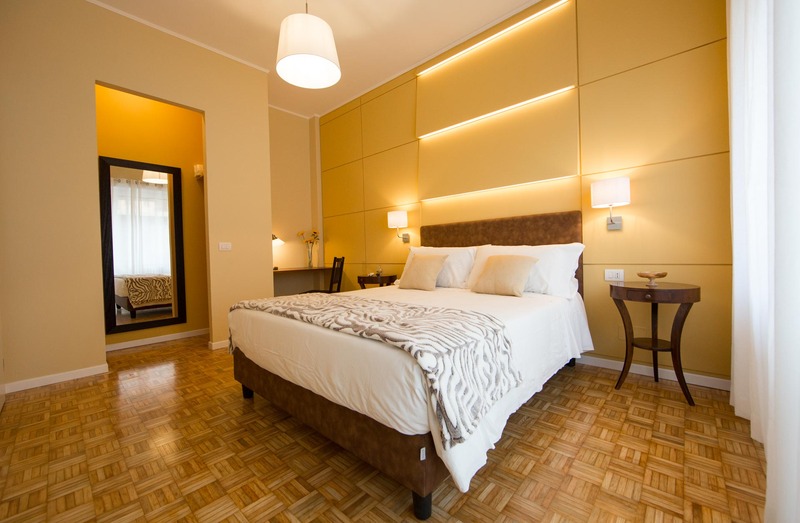 All beds and mattresses come from the prestigious Dorelan Hotel Line that ensures blissful sleep for tired travellers. 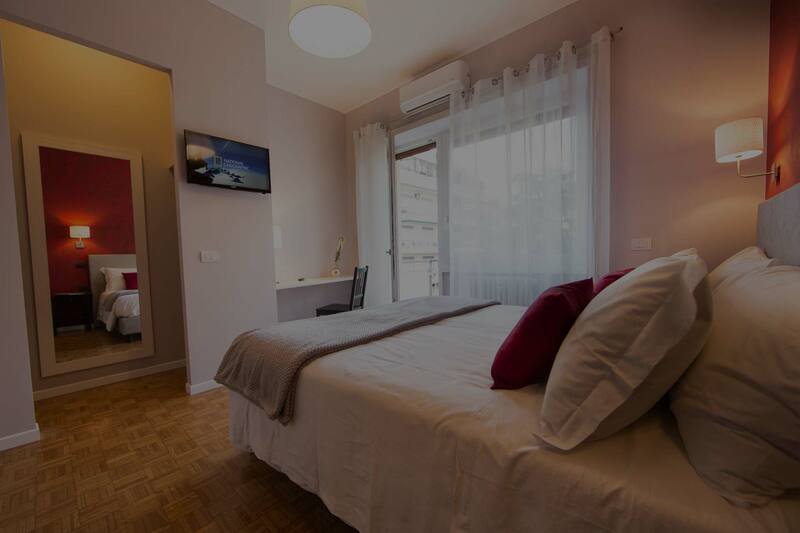 All rooms have air conditioning, HD televisions, complimentary WiFi, safe deposit boxes, and hair dryers. 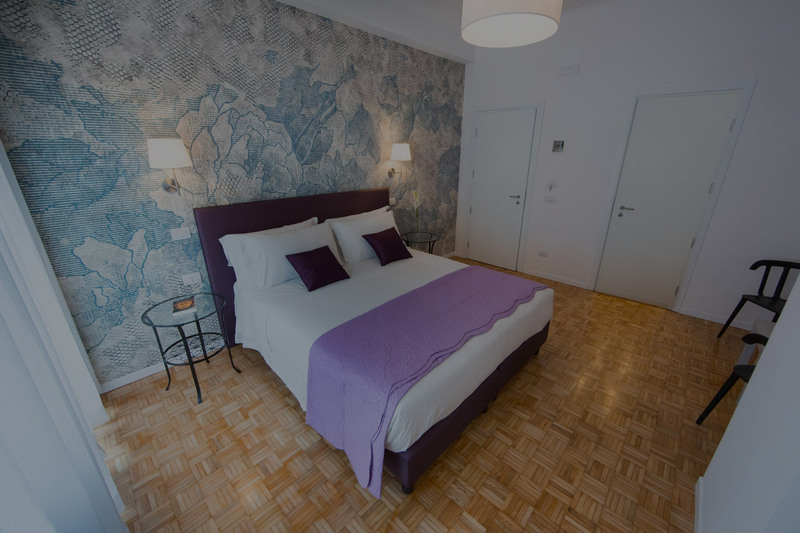 Please take a virtual tour of our rooms. Large double bed or two singles – 3rd bed available. Large double bed or two singles. In this bright room with Roman themed wallpaper, guests can enjoy breakfast, sip the complimentary tea and coffee, or simply socialize with other B&B guests. The feel of the space is upbeat and modern. A large wooden table is surrounded by red chairs that infuse the room with joyful colour. A shelf contains brochures, maps and other relevant information about Rome and its activities. All prices are per night, in euros. Our prices vary according to season and number of guests and include the use of facilities, cleaning services and breakfast. A daily city tax of 3.50 Euros per person will be collected in cash upon arrival. The tax is applied for a maximum of 10 days. We accept all major credit and debit cards with the exclusion of American Express. Payments can also be done via PayPal but cheques will not be accepted. One night deposit will hold the reservation. Cancellation policy: full refund if reservation is cancelled more than 7 days before arrival. Take a peek at our blog to find the best selection of fun events Rome has to offer!